Dwelling in the surreal Andes Mountains of South America for thousands of years, Quinoa (Keen-wa or Keen-uwa) is not just an ancient but also a miraculous supergrain in every sense. It is one of the rare foods that are known to be complete source of protein. Rescuing us from nutritional deficiencies & illness, the superfood Quinoa is definitely a health super hero. Mother Nature is at her artistic self when the Quinoa crop emerges from its pod, bestowing energy and abundance to the ancient crop. The plants grow quite tall and are abstractly beautiful with vibrant colored pods surrounded by crafty green leaves. The pseudo cereal Quinoa is a wonderful example of bountiful beauty and wholesome health food. Teeming with nutrient this super grain has great health benefits. It is high in proteins and carbohydrates and is excellent source of nutrients, fiber and essential vitamins. It is gluten-free, low cal & low fat. Studies around the world has shown Quinoa is a healthier option for hypertensive & diabetics. It is a good alternative to wheat and wheat products for the gluten intolerant. 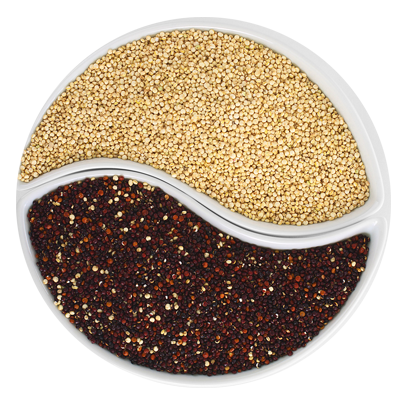 The Quinoa seeds contain essential amino acids and acceptable quantities of calcium, phosphorous and iron. The health benefits are many and counting.